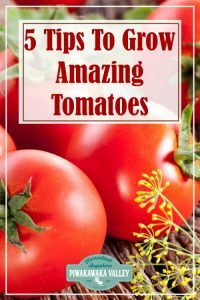 Tomatoes are not all that difficult to grow and can be a fantastic achievement for even the most amateur of gardeners. Following just these 5 simple tips will ensure sweet and juicy tomatoes that are ready to harvest quickly, and delicious to eat. It is a common misconception that this fruit requires regular watering and that the ground should be moist constantly. Tomatoes are classified as a fruit as they have seeds unlike vegetables. However, these fruit do not like too much water. Over-watering will result in blisters forming on the leaves as well as on the fruit. It can also result in cracks appearing in the fruit. Over watering will actually kill tomato plants. On average, a 4-6 foot tall tomato plant requires about 1 – 2 inches of water a week depending on the season and climatic conditions. This amount should be spread throughout the week in a couple of waterings rather than all at once. On hotter days and during warmer months, an extra watering during the day may be required. If the leaves are wilting and turning a dark green or brown color, the plant needs water ASAP. Young plants may also need just a little extra water until they get their roots established. If you are growing your tomatoes in pots, you will probably have to water them more often as their roots cannot grow deeper on their hunt for water. 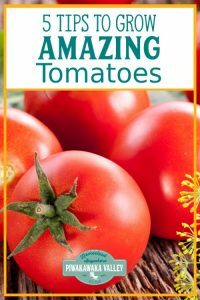 There are a wide variety of tomato plants to choose from each which have their own characteristics and are ideal for a specific or many different uses. The most common types are standard, garden variety, plum and cherry or vine tomatoes. Choose a type that suits your climatic and soil conditions carefully, especially if you are growing them outside. If you don’t want to take these two factors into consideration, then it may be better to grow the tomatos you prefer in a tunnel house or green house. You may also need to be prepared to provide a little extra care for your plants such as additional nutrition and a trellis or climbing structure for vine tomatoes. With just a little research, you can create the ideal climatic and soil conditions to grow tomatoes successfully year round. Although many professional gardeners will disagree, it isn’t necessary to fuss and fiddle to much with a tomato plant in order to yield a harvest. You may be told that the plant will need to pinched, the tops chopped off and it’s nutritional needs taken care of carefully. Leaving your tomato plant to it’s own devices after initial feeding and care will still provide you with a good and healthy crop and is ideal to get started as beginner gardener. Determinate tomatoes definitely need less input for new growers, but if you just want to let an indeterminate vine run rampant, you will still get plenty of fruit. However, it is important to note that the extra care and pruning that is recommended by the experts will yield a larger crop that has a better taste value. Experiment and learn as you go along what suits you best to grow tomatoes that are tasty and provide a harvest that meet your requirements. Tomatoes like plenty of warm sunlight all day around especially when they are still seedlings or young plants. Choose a location in your garden that provides them with all the sunlight that they desire, keeping in mind the watering requirements of the plant. Also don’t plant your tomatoes too close together to prevent over-crowding which can stop optimal sunlight from reaching the plant. If you plan to prune hard like I do, you can plant them 12-15 inches apart. If you want to let them run wild, then they will need closer to 3-6 feet space each depending on your plans and how you want to stake or prune them. If the leaves at the bottom of the plant start turning yellow, it is not receiving enough sunlight to them. You can remove the bottom leaves if they start to yellow. If you are planting in a tunnel house, you will need to provide some additional warmth and light until the days are nice and warm and long. Artificial lighting should be sufficient and should be turned on for around 15 hours every day. To get around this, we just wait until the last frosts outside to plant our plants in the tunnel house. Air circulation is very important to grow strong and robust plants. Once again, don’t plant too close together to allow as much air to circulate around the plant as possible. Tomato plants in your garden should ideally be located where they are exposed to wind and not protected from it. The wind and air circulation put strain on a young plant ensuring that it grows strong stems that are able to carry the weight of the plant and the fruit later on. If your tomato plant is lying on the ground or the stems are drooping under the weight of the fruit, it did not get enough wind during the early growing phase. If you are planting in a tunnel house, provide some artificial wind by placing a fan or fans strategically. Remember to alternate wind direction and even strength to mimic outdoor growing conditions as much as possible and ensure that your tomato plant is strong on every side. 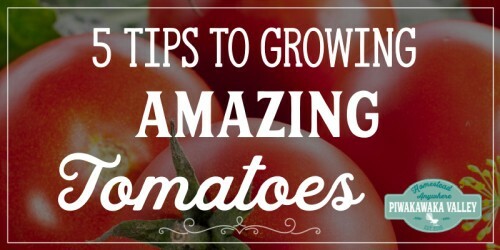 It is important to give your plants time to mature and for the tomatoes to ripen properly. Picking a tomato every now and again to test for readiness to harvest is recommended. A tasty, juicy fruit is ready for harvest keeping in mind that not all the tomatoes on the same plant will ripen at the same time so only pick those that have a similar coloring. Heritage tomato plants can be hard to know when they are ripe. Check out my post on working out when heirloom tomatoes are ripe.